Conveniently located near I-5 in south Bakersfield, the Country Inn & Suites invites you and your pet to enjoy our comfortable hotel rooms and suites. Sip freshly brewed coffee in the comfort of your room as you read the free weekday USA TODAY® newspaper, and then set up your laptop on the work desk and take care of business using our free Wi-Fi. For your convenience, each of our 64 rooms and suites also includes handy appliances like a refrigerator, microwave, hair dryer and iron. Choose between one king bed, two queen beds and two full beds in our Standard Rooms. These rooms also feature all standard amenities, such as a 50-inch TV and free high-speed Internet access. 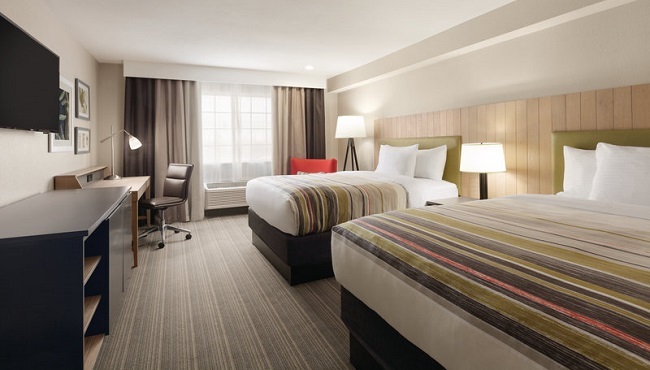 Featuring a comfortable king-size bed, the Premium King Room also includes a Smart TV and a larger work desk. Celebrate a special occasion by upgrading to our King Whirlpool Suite. This romantic suite includes a plush king bed and an in-room whirlpool.